A good while ago, probably more than a year, I posted about my Thomas Tusser project – my hope of creating my first booklet – a kind of almanac with one page for each month, a cover, a back with colophon and the inner covers blank. The iron chase that I build my formes in, divides into 4 with bars, and then by subdividing again with furniture, you can create 8 pages on one side, and 8 pages on the other. So from one sheet you can make a 16-page booklet. Looking at books, you can see that they are all created from multiple booklets like this, all sewn or glued together. The proper name for the printing-in-eight is octavo, and there are other formats based on the division of the chase, e.g. quarto, folio, duodecimo and so on. So anyway, this spring, my blocks were ready, the type and spaces were bought, and a year later than planned, I had the time to set up the first half. So I picked up my imposition plans from 2016 and set to work. 16 hours later the forme was ready. It was taken to a re-enactment event at Newbury, commemorating the 375th anniversary of the battle there. A pretty challenging site – I’ve printed in the tent many a time, but the slope on the field was noticeable. We had a wooden base to support it, and foam underneath that to soak up the rocking. The field had previously been fallow and full of nettles and thistles – the stumps were there waiting for anyone who dared to wear sandals during setup – and there were flying as well as human visitors. 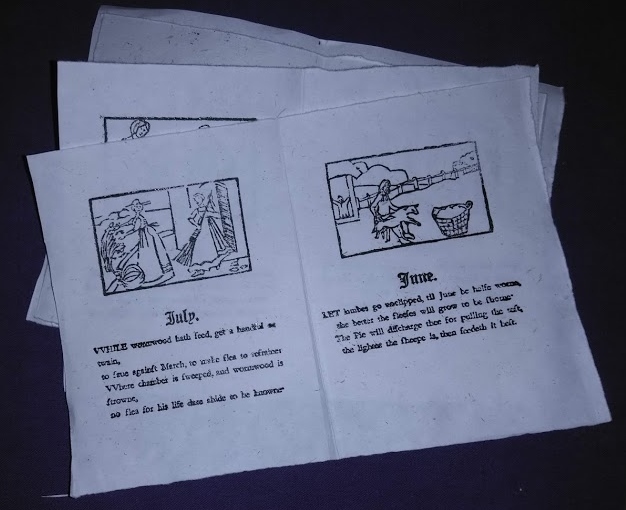 The two days went quickly with me explaining all about the imposition and how it is necessary to place the pages in a particular order in the forme so that the booklet is created in the right order. However a little way in to the event and looking at the prints, I started to feel that something wasn’t quite right. But there was no time to really think about it because the event was so busy. OOPS, I think June comes before July! imposition was wrong. When I took a printed sheet and folded it up, the front page was at the back and the colophon at the front! I remembered that I’d looked at Plantin’s imposition plan and wondered why it made no sense…then looked at it in the mirror and it did…I’d made myself a little blank booklet to understand it…so why was it wrong? Then I realised that the Plantin plan shows what the forme should look like. The mirror shows how it looks in the paper. Well….I had promised myself tears and teeth gnashing in this project. No tears yet, just teeth gnashed at myself for my own stupidity and over-thinking it. I’ve got a very good value source of paper at the moment so I was able to be philosophical about the wasted cost. But still. What lesson to learn? Probably not to leave a project for a year half way through! The other kind of lucky thing about it was, that although I’d realised this huge error when I had started breaking down the forme, I hadn’t got as far as breaking down the text. So I was able, gingerly, to resurrect the forme – this time hopefully in the proper order . 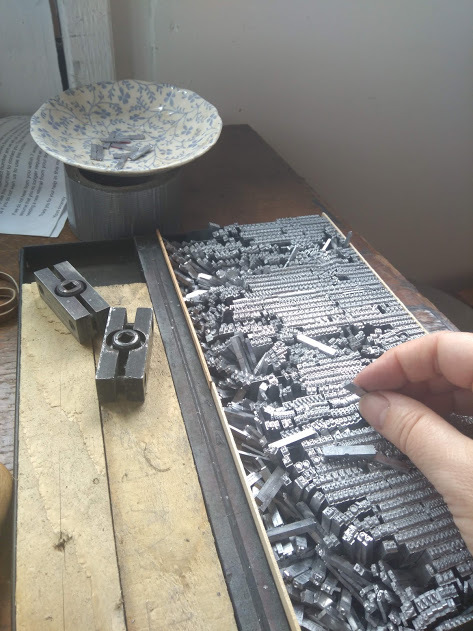 It’s a bit vexing to have to go over the same ground at the next event, but oh well, it will be a different audience….Sharing space with a handsome Columbian press from 1855 , Press Genepy will be at Royston Museum on Saturday 28th July and I’ll try to get it right this time! Ooofff! !! Tough break! 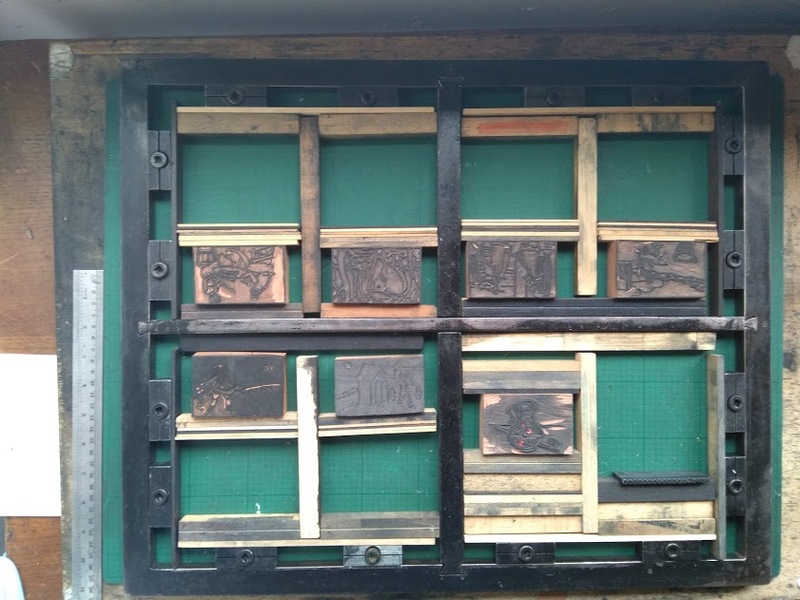 But the paper isn’t lost, use it for drawing or collage or overint in colour or break it into separate pages and frame each up …. lots of possibilities. Swansea Print Worksop has a 1855 Columbian too, a magnificent beast!